To mark 100 years since the death of mountaineer Sir Hugh Munro, whose name is used to describe Scottish mountains with a height of 914m (3,000ft) or more, we asked climbers to pick their favourites from the list of 282 peaks. "That's a very difficult question," says outdoor writer, photographer and long-distance walker Chris Townsend when asked to name the Munro closest to his heart. "Overall I think my favourite is Ben Macdui, because of its situation at the heart of a huge area of wild land and spectacular mountain scenery." Britain's second highest mountain, 1,309m (4,295ft) Ben Macdui is in the Cairngorms. 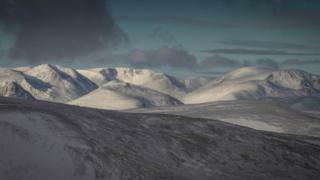 The mountain is said to be haunted by a supernatural creature, The Big Grey Man of Ben Macdui. The myth describes him as a Scottish Bigfoot, said to loom large in shifting grey cloud. The Big Grey Man of Ben Macdui first came to prominence in the 1920s during a dinner speech at an annual gathering of the Cairngorm Club in Aberdeen. Its honorary president, the highly respected mountaineer Prof John Norman Collie, told of a frightening experience on Ben Macdui in the Cairngorms 35 years earlier. It is believed Prof Collie had been spooked by a weather effect know as a brocken spectre. Chris first climbed the Munro more than 40 years ago. "I've been walking in the Scottish hills since 1976 when I climbed Cairn Gorm and Ben Macdui, my first Munros," he says. "On the summit I feel far from anywhere and the views are tremendous. There's a feeling of seriousness, remoteness and vast space." Rock climber and journalist Natalie Berry's favourite is another giant of the Scottish mountains. "Despite having grown up in the north of Glasgow from the age of three, it wasn't until my early 20s that I started venturing into the hills," she says. "As a rock climber, I haven't done nearly as many Munros as a hillwalker might notch up, but my favourite would have to be Ben Nevis." One of the best known Munros, Ben Nevis is Britain's highest mountain at 1,345m (4,413ft). Natalie reached its summit with Lochaber-based Ben Nevis expert Dave MacLeod having climbed a winter route together called Pink Panther. It was the first route Natalie had climbed on the Ben. "Leading up the snow slope to the summit was quite exciting, and as I pulled over the cornice at the top my foot slipped," she says. "Thankfully my axes held, but it was a nonetheless memorable moment." Hugh Munro, whose family were Scottish landowners, was born in London in 1856 and brought up at Lindertis near Kirriemuir in Angus. He was educated at Crieff, Winchester and Cambridge. Munro went on to learn German in Stuttgart, studied a business course in London and served as a cavalryman in the Basuto War in southern Africa. He had climbed in the Alps while in Germany, and he continued this interest in mountains when he settled at the family estate near Kirriemuir. Munro was a founder and president of the Scottish Mountaineering Club (SMC). And it was the club that set him the task of listing all mountains of 3,000ft or more. According to The Munro Society, Munro was the ideal person for this work because of his meticulous record-keeping, enthusiasm for work in the outdoors and fascination with mountain landscapes. Munro never managed to climb all the mountains he listed. In 1919, he died of pneumonia while running a canteen for soldiers in Provence, France. He was 63. But Munro's fascination with Scottish mountains lives on in the many people who climb them today. Among them are Munroists or Munro-baggers, climbers dedicated to ascending every one of the 282 listed Munros. Those who accomplish this feat are known by the SMC as "compleators". Sir Hugh's achievements are celebrated as part of the exhibition at the Kirriemuir Gateway to the Glens Museum. There is also Munro Society exhibition dedicated to the mountaineer running at Perth's A K Bell Library. Climber, writer and film-maker Dave MacLeod, who accompanied Natalie on her first ascent of Pink Panther, has been walking and climbing in Scotland's hills for 25 years. "I haven't climbed all the Munros because I've been more focused on the climbing side. For this reason Ben Nevis is undoubtedly my favourite Munro," he says. "Its size and many steep and hidden coires make it seem more like a mountain range than a single mountain. "There's enough interest on the Ben for a lifetime of climbing, or indeed interest of multiple types." Last year, Helen Rennard became the first woman to complete the Winter Tranter Round, a 36-mile challenge that involves 19 Munros, among them the Mamores, Aonachs and Ben Nevis. "My first Munro was Cairn Gorm at the age of 11, during a family summer holiday to Aviemore," she says. "There was then a gap of six years, until I was 17, when I went on a week's winter mountaineering trip to Glen Coe and Ben Nevis with a climbing club from Stafford. "It was me plus a load of men in their 40s, which was a bit odd, looking back on it." Helen got the winter climbing bug when she was 20 and at university in Aberdeen. Her favourite Munro is 1,155m Lochnagar, a mountain not too far from Aberdeen. "I love the view of the coire in winter, especially when you get your first glimpse of it. "The whole place has huge sentimental value for me as it's where I started Scottish winter climbing and I've had many days out in winter there with good friends." Today, there is a Hugh Munro close to completing his first round of all the 282 Munros. From Westhill, Aberdeenshire, he just has a handful of mountains left to bag and plans to finish with 981m (3,218ft) Slioch with its "calendar views" of Loch Maree in Wester Ross. "When I got to 200 Munros I thought I would have to do them all," he says. "I looked up the list that is maintained by the Scottish Mountaineering Club, where people register if they have completed the Munros, and I noticed no-one called Hugh Munro has ever done them all." Hugh had hoped to have completed his round by the 100th anniversary of Sir Hugh Munro's death, but an injury sustained in a skiing accident hampered his progress. Now recovered, he has resumed his effort to complete his round. "From an early age I have been interested in mountains," he says. "When I was 14, I went on a camping trip through the Lairig Ghru in the Cairngorms. That was a life changing moment and I have never looked back since then." Fiona Russell, who runs the business Fiona Outdoors and is an outdoors and adventure journalist and blogger, has been climbing in Scotland's hills for about 20 years. She says: "I have always been a sporty person, enjoying judo, running, triathlon, cycling and skiing. However, I was around the age of 30 when I started to venture into the hills and mountains of Scotland. "I started walking the Munros when I met my husband Gordon (Lacey) almost 10 years ago. I never imagined I would be as close as I am now to finishing a round." She adds: "My husband finished his first round within about two years of us meeting. I walked around 80 of his last Munros in his first round with him. "Some years later I realised I had walked more than half of the 282 Munros. Now I have just 42 to go." Gordon, meanwhile, is two thirds of the way through his second round. Fiona has favourite groups of Munros. She says: "It was on the Five Sisters of Kintail - with its three Munros, Sgurr na Ciste Duibhe, Sgurr na Carnach and Sgurr Fhuaran - that I first met Gordon. "We became walking buddies and friends and then we got together romantically. We were married last year on a snowy mountain slope in British Columbia. "My second favourite group of Munros is across the glen on the South Glen Shiel Ridge. We enjoyed an amazing walk of the seven Munros there one fabulously sunny day in early summer some years ago. "The Munro I'm most proud of is the Inaccessible Pinnacle on the Cuillin Ridge on Skye. "I am not good with heights yet I made it to the top of that exposed rock." Fiona adds: "There are so many Munros that bring back amazing memories."